Home Brands Blackweb Gaming Mouse: Perfect for Your Gaming System? Blackweb Gaming Mouse: Perfect for Your Gaming System? You may have seen the Blackweb Gaming Mouse while perusing the Walmart computer and gaming aisle and wondered if it was any good. Well, we don't have to tell you that when you're gaming, the hardware is everything. If you're trying to play with any old mouse, you're missing out on a lot of functionality that a better-equipped player will have. A slower response time, or a mouse with only two buttons, is a hindrance when playing online. If you stick to single player, a mouse made for gaming will help in the most challenging levels. But for a hobbyist gamer, a proper gaming mouse could be prohibitively expensive. The RGB Programmable Blackweb Gaming Mouse we mentioned is a product of the Wal-Mart brand Blackweb. It competes with established gaming brands for a spot on your desk. But you want to know if it will stand up to the pitched battlefields of PC gaming. What is the Blackweb Gaming Mouse? The Blackweb RGB Programmable Gaming Mouse provides a customizable gaming experience on a budget. 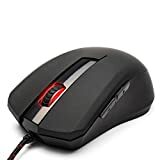 If you're just getting into PC gaming and need an all-purpose mouse, looking for a lower-priced mouse can free up money for other expensive PC parts. But picking the right mouse can be difficult. A traditional two-button mouse is okay for browsing, where response times don't matter. When the stakes are high, you may not have enough space on your keyboard to do everything you need to. That's why gaming mice are so important. Your lifesaving button is now only a thumb-click away. An all-purpose mouse is especially helpful if you're not looking for specialized features. A mouse for a first-person shooter might have a dedicated “Sniper” key, or an MMORPG mouse would have a button for every single ability. If you're a new gamer, or you don't play professionally, you may not need these extras. That is where a mouse such as the Blackweb Gaming Mouse comes into play. These mice lack the advanced specifications of a first-person shooter or MMO mouse. Even so, they still offer a balanced gaming experience. The RGB Programmable Blackweb Gaming Mouse offers customizable features not included with mice of a similar price range. Its light emitting diode (LED) is fully programmable, allowing for millions of different illuminations. It could include a single color, a rotating pattern, or a status indicator based on your game. That makes for a mouse that is unique to your computer setup and personality. On a more functional note, this Blackweb gaming mouse has seven programmable buttons. Programmable buttons allow you to react more quickly in-game. By binding commands to the buttons available to your thumb and middle finger, you can make game-winning plays without losing your place on the keyboard. Having quick response keys like this are key to any game mouse, and important to any serious gamer. Where the RGB Programmable Blackweb gaming mouse departs from its peers is in its physical form. Other mice in this price range are relatively form-static and cannot be adjusted. The Blackweb RGB mouse differs by having an adjustable grip. Comfort and ergonomics are important to game performance. This mouse allows you to change its grip into the configuration that fits you best. The mouse also includes four weights that you can add or remove as needed. A mouse that is too light or heavy can affect your reaction time in-game, and physically weighing the mouse will make it perfect for your preferences. Reviews for the RGB Programmable Blackweb Gaming Mouse are largely unavailable from professional sources. The reviews which are available for this mouse are from Wal-Mart's website. This mouse earned 3.3 stars out of 5 from six reviewers on the website. The one negative review indicated that the mouse they received regularly disconnected from their computer after only a few days. Other reviews were positive, granting four or five stars. The most common complaints were that the software for the mouse was difficult to find, and the buttons clicked too easily. However, customers did find the mouse to be easily programmable and ultimately an improvement to their gaming. Reviewers recommended it as a starter gaming mouse. The RGB Programmable Blackweb Gaming Mouse costs between $32 and $36 on the Wal-Mart website. This price is comparable to other entry-level gaming mice with similar features. It is also available from VIP Outlet and on Amazon. The RGB Programmable Blackweb Gaming Mouse goes up against some heavy hitters in the gaming hardware industry. The mice selected for comparison offer a competitive price point and functionality. Our review includes the SteelSeries Rival 110, the Logitech G602, the Corsair Harpoon RGB, and the Turtle Beach Grip 300. These four mice represent some of the best the industry has to offer for all-purpose gaming mice. We based our comparison largely on features and price. Features that affect the utility of the mouse, such as programmable buttons, are valued more than aesthetics. The durability of the mouse and its cable is also important, as a mouse that breaks quickly cancels out its low price. Each mouse included has also been reviewed on reliable PC gaming sites like IGN or Tom's Guide. We also checked consumer reviews from Newegg.com for ratings. The Turtle Beach Grip 300 has the fewest buttons of any mouse included here. It only has five. It also lacks the instant DPI switch that most of the others include. In fact, the Turtle Beach Grip has no software at all. That makes for a more streamlined experience, but also less customization. Two switches on the bottom allow you to determine the DPI and polling rate, which is how fast the mouse communicates with the computer. Tom's Guide tested the mouse on a variety of games and reported that it works best with first-person shooters. For FPS gamers looking for a frill-free mouse, the Turtle Beach Grip is a good choice. Tom's Guide gave the Turtle Beach Grip 300 four out of five points. While only five reviewers on Newegg gave the Grip 300 a full five eggs, 94 Amazon customers rated it 3.9 stars out of 5. The Corsair Harpoon RGB is a right-handed mouse with clean lines and good grips. It includes programmable LEDs for the logo and six buttons. One of the places it stands out is with a dedicated “Sniper” button. Sniper buttons are usually found on higher-end FPS mice, and drop your DPI to allow for more precise shots. You can also set five DPI settings for other scenarios. IGN's review also claims that the rubber grips on the side and curve of the body fit easily into your hand. It helps you keep a solid grip when playing through intense situations. IGN rates the Corsair Harpoon RGB 8.5 out of 10 points, while Newegg customers gave it 4 eggs out of 5. The SteelSeries Rival 110 presents with a slimmer profile than the Blackweb Gaming Mouse. It lacks in adjustable pads and is nearly ambidextrous, except for two buttons on the left side. These buttons are programmable, as are the LED lights on the logo and the scroll wheel. The software is user-friendly, making it easy to configure user settings. In addition to the LED programming, the SteelSeries software lets you program the Rival 110 to two DPI settings. That lets you switch your mouse between two sensitivities for different game scenarios, although other mice on this list allow more settings. IGN rates the SteelSeries Rival 110 at an 8.4 out of 10, calling it a great mouse for a low price. On Newegg, 42 customers gave the Rival 110 3 out of 5 eggs. Logitech's G602 is the most expensive model on the list with a base price of almost double that of the other options. However, we included it because it's regularly available at around the same price as the other models. Aside from the RGB Programmable Blackweb Gaming Mouse, it's the most ergonomically designed. Distinctly right-handed, it also offers a massive 11 buttons. It offers multiple profiles for storing button preferences. That allows you to create a setup for each of your favorite games and smoothly switch between them. Although it lacks as many buttons as other mice, it hits above its weight according to the sale price. Tom's Guide rated it four points out of five (totally worth it), and Newegg users gave it four out of five eggs. The RGB Programmable Blackweb Gaming Mouse has some stiff competition. As such, it's important to take a close look at everything that sets this mouse apart from its counterparts. Whether good or bad, these are the key reasons the Blackweb RGB mouse stands out. When you're buying your first gaming mouse, it's important to find a balance. If you're not a professional gamer, shelling out for a high-end mouse with specialized buttons is likely unnecessary. At the same time, you want a mouse that can be fine-tuned to take you from amateur to pro. The RGB Programmable Blackweb Gaming Mouse can do the job. While it may lack the name recognition of other better-known manufacturers, it still offers many comparable features. At the same time, the other brands offer a comparable mouse at a comparable price. Unlike Blackweb, these companies devote their entire production to gaming hardware. They have more experience building products that will last and will work for a wide variety of gamers. For the same price as the RGB Programmable Blackweb Gaming Mouse, you can purchase a Corsair or Turtle Beach product. One of these products is more likely to stay with you for years of use. Overall, this Blackweb Gaming Mouse will get the job done. In fact, it will get it done with millions of RGB settings and will fit your hand how you want it to. It's a decent mouse and is available for a decent price if you look in the right place. If all you want a mouse for is to game with your friends on the weekends, this could be the right pick for your rig. Previous articleCould the Logitech G Pro Gaming Mouse Help Enhance Your Experience? Is the Hp Pavilion Gaming Laptop Worth Buying in 2019?